Climate change may have played a role in most of them. “It was sad to see such beautiful country being destroyed over a couple of hours,” Gaston Browne, the prime minister of Barbuda, said after Hurricane Irma struck the Caribbean Island, razing nearly all of its infrastructure. That sentiment could be applied to a broad range of natural disasters in 2017, adapted, of course, to specific circumstances. Throughout the year, floods, landslides, avalanches, earthquakes, hurricanes, and more killed thousands of people and caused enormous damage, straining domestic and international relief efforts, and raising the fear that climate change was ratcheting up the strength of natural disasters. Here are 12 of the worst natural disasters from the year. A handful of salvaged items sit in front of what remains of a home destroyed by Thursday's magnitude 8.1 earthquake, in Asuncion Ixtaltepec, Oaxaca state, Mexico, Sept. 10, 2017. 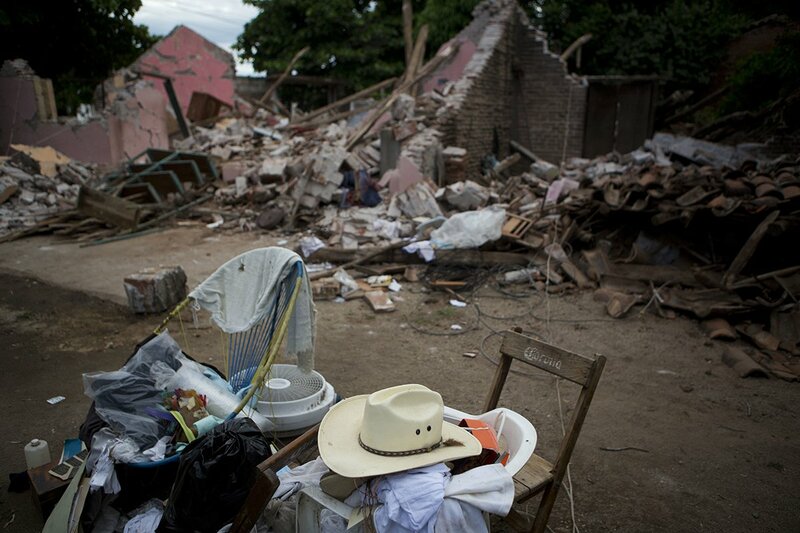 In back-to-back weeks in September, massive earthquakes struck Mexico. The first quake was 460 miles from Mexico City, while the second was a mere 75 miles away from the capital. Both events were devastating, killing hundreds of people throughout the country as buildings collapsed and infrastructure failed. Sulem Hire 9, uses a rope attached to a jerry can to pull water from a borehole in Ethiopia. Across 17 countries in Eastern and Southern Africa, below-average precipitation fueled droughts that put 38 million people at risk of not having enough food. In Ethiopia, for example, a brutal drought devastated crops, leaving 7.7 million people without food. 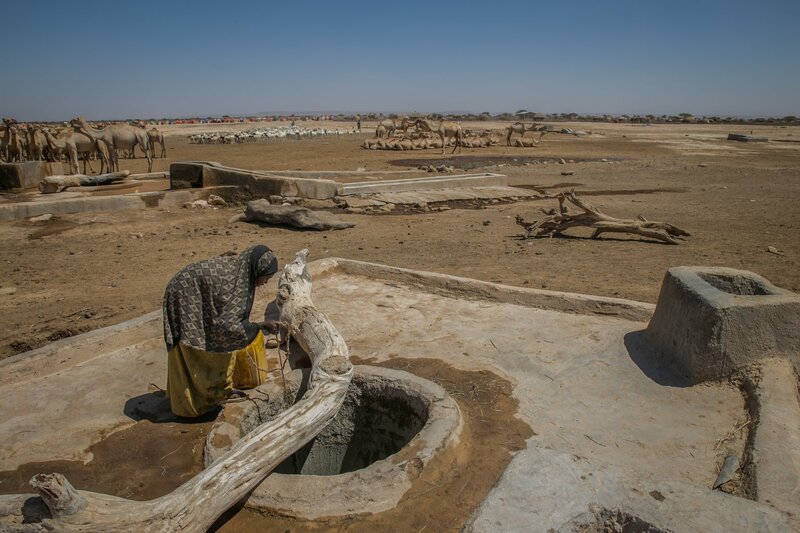 A massive humanitarian effort has been waged across the region to help stem the consequences of famine, but if droughts continue in the years ahead, the problem will only grow worse. People walk through a waterlogged street following heavy rains in Mumbai, India, Aug. 29, 2017. 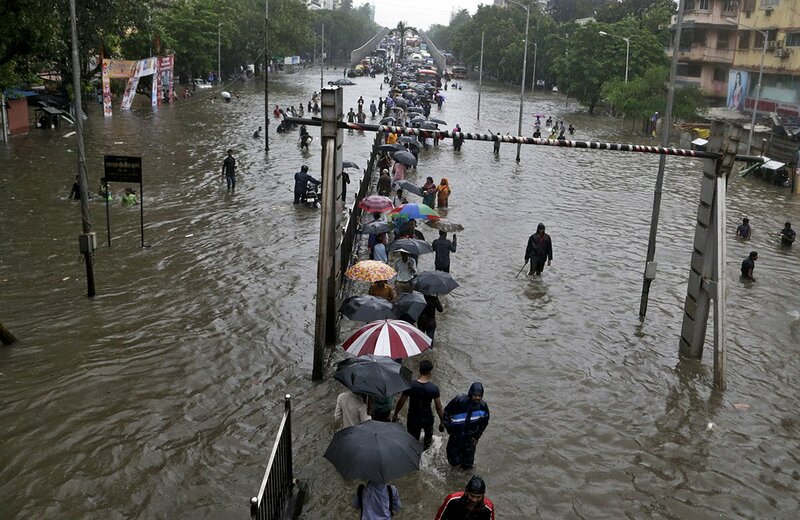 Powerful monsoon rains in India, Bangladesh and Nepal flooded homes, triggered landslides, and destroyed infrastructure. All told, more than than 1,200 people were killed in August, and millions more were displaced. Heavy snowfall in Northern Afghanistan unleashed an avalanche in February that buried towns in up to 10 feet of snow. Hundreds of men, women, and children were crushed by the avalanche or froze to death underneath the snow. 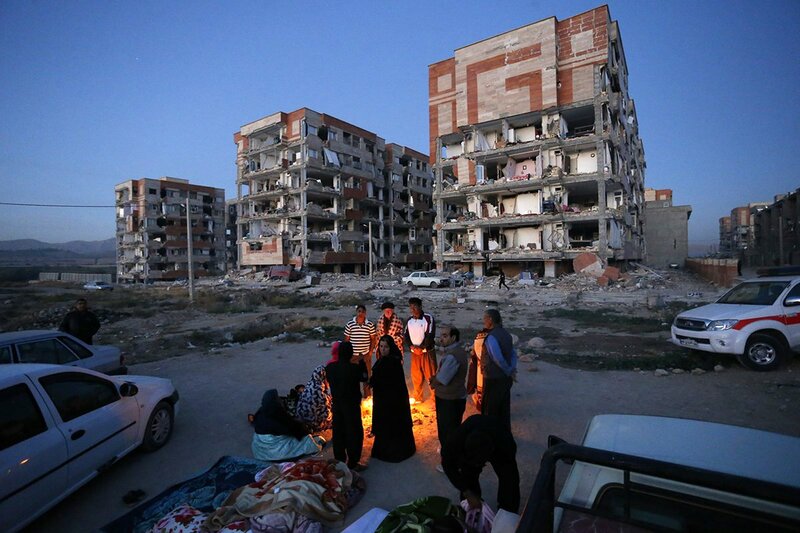 Survivors of the earthquake warm themselves in front of destroyed buildings at the city of Sarpol-e-Zahab in western Iran, Nov. 13, 2017. The deadliest earthquake of the year struck Iran in November, wrecking buildings and homes, killing more than 530 people, and leaving thousands more injured. 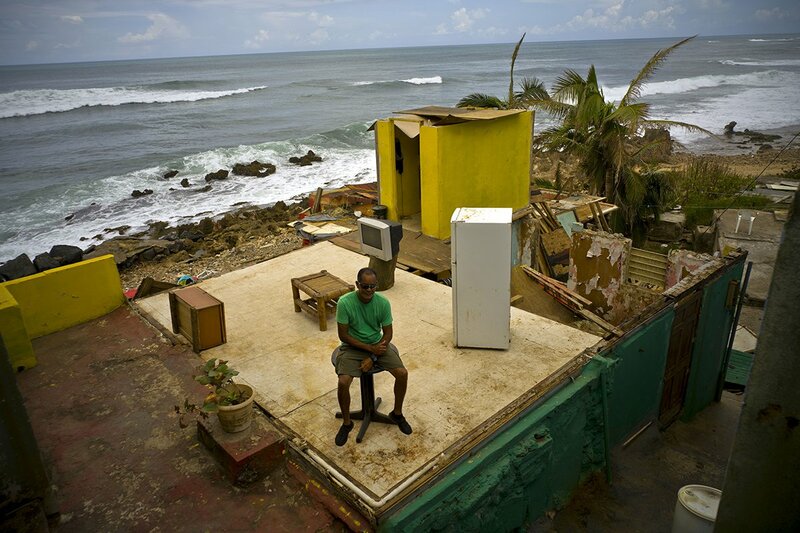 Roberto Figueroa Caballero sits on a small table in his home that was destroyed by Hurricane Maria in La Perla neighborhood on the coast of San Juan, Puerto Rico on Oct. 5, 2017. For the first time in more than a century, 10 full-fledged hurricanes that went on to make landfall formed in the Atlantic. Three of those hurricanes — Harvey, Maria, and Irma — devastated countries such as Barbuda and Cuba and US states like Florida and Texas. Puerto Rico may have been the worst affected by the hurricanes, which caused the majority of the island to lose electricity and access to food and water. Read More: 6 Weeks After Hurricane Maria, Nearly Half of Puerto Rico’s Schools Are Closed. Why? Global Citizen campaigns on the Global Goals, which call for robust relief efforts after natural disasters. You can take action on this issue here. 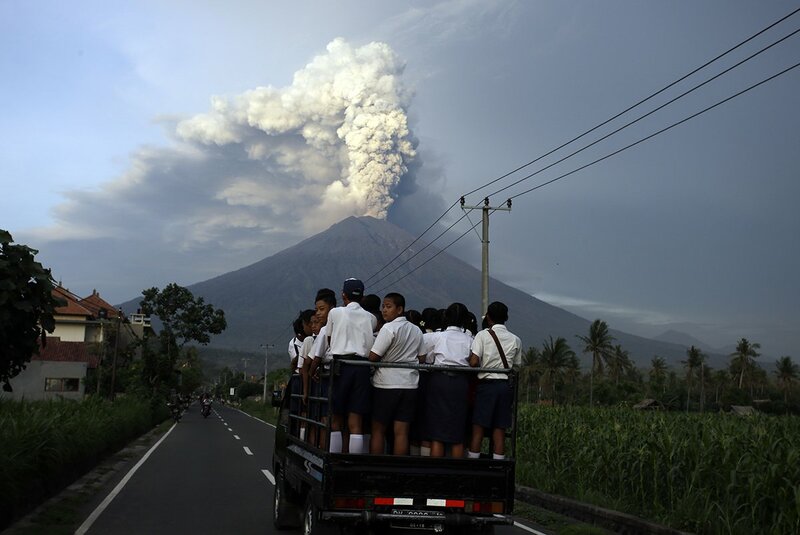 School students stand on a truck as their transport to go to school with the Mount Agung volcano spews smoke and ash in Karangasem, Bali, Indonesia, Nov. 28, 2017. At the end of November, the Mount Agung volcano erupted in Bali, Indonesia, sending enormous plumes of ash into the air, and forcing an evacuation of more than 100,000 people. The region is still on edge, as the volcano doesn’t seem to be done erupting. At the end of May, the heaviest rains since 2003 engorged rivers throughout Sri Lanka, causing them to flood towns and cities and triggering landslides that killed more than 91 people. A man looks at a mud covered area in Mocoa, Colombia, April 2, 2017. Surging rivers sent an avalanche of floodwaters, mud and debris through a city, killing at least 200 people and leaving many more injured and homeless. 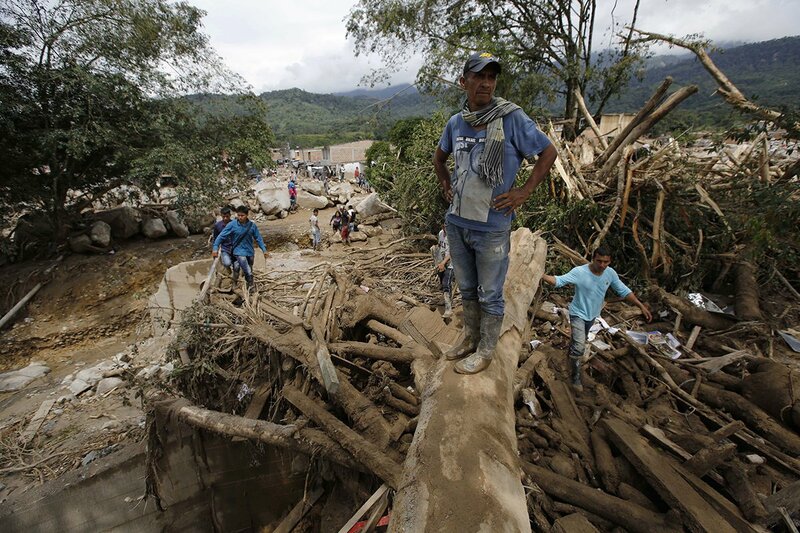 Devastating landslides also struck Peru and Colombia because of heavier than normal rains in April. Hundreds of people were killed in both countries and the United Nations warned that similar freak events will become more common if climate change continues. Another series of deadly landslides hit Sierra Leone in September after, you guessed it, above average rainfall. In the end, more than 500 people were killed and the ensuing destruction put hundreds of thousands of people at risk of a cholera outbreak. 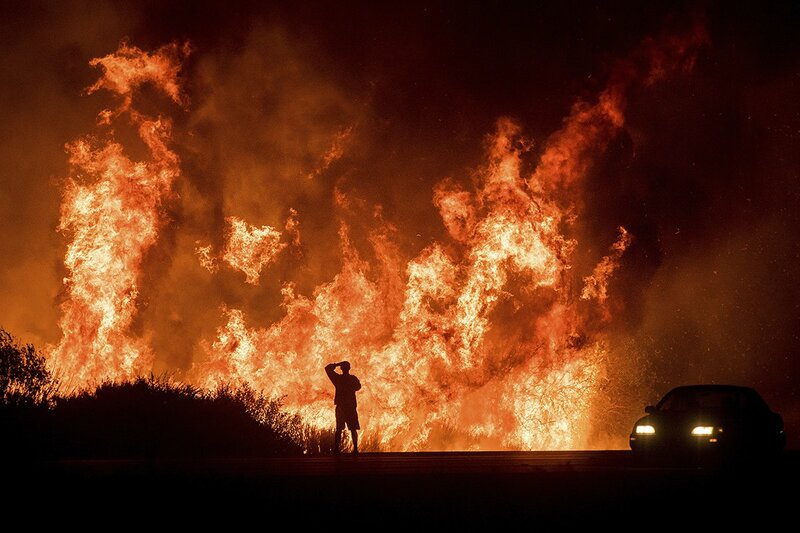 A motorist on Highway 101 watches flames from the Thomas fire leap above the roadway north of Ventura, Calif., on Dec. 6, 2017. California is facing one of the most destructive fire seasons in its history. A strange combination of above-average rainfall, drought, sprawling development, and a longer fire season have all contributed to the blazes, according to the New York Times. Few events have highlighted the link between climate change and devastating natural events like California’s fires.